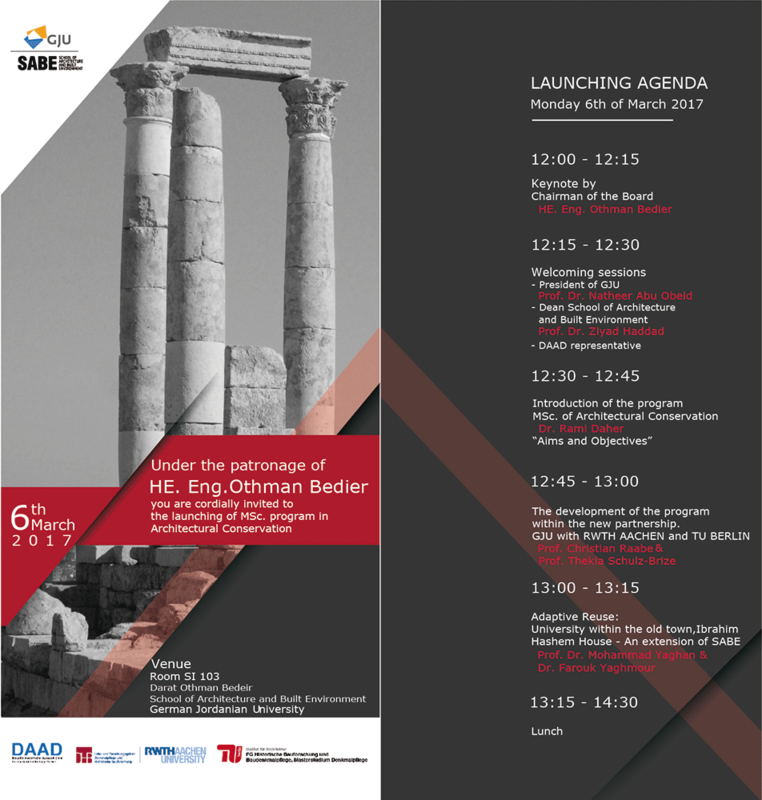 Cultural Heritage at the TU-Berlin in cooperation with the German Jordanian University. program with Visiting Professors experts in the field, while the main bulk of the teaching is provided by the GJU teaching staff and professors. The Program is sponsored by the German Federal Foreign Office as part of the project "Die Stunde Null - Eine Zukunft für die Zeit nach der Krise". (Literally meaning Zero hour: a future after the crisis). Moreover, the project is an initiative by the "Archaeological Heritage Network" and under the directorship of the DAI "German ArchaeologicalInstitute" in cooperation with the DAAD " German Academic Exchange Service". We are looking forward for a productive and successful cooperation, especially for all the students. By reconstructing and safeguarding elements of a monumental Buddhist temple dating from the 13th century, research findings can now be presented for the first time on the site of the former Mon- golian capital of Karakorum, where they were discovered. 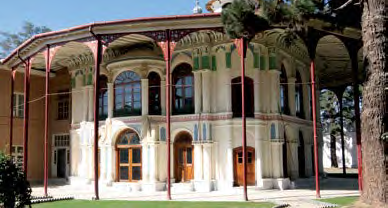 Karakorum is located around 300 kilometres west of Ulan Bator in the Central Mongolian grass steppe. For a short time during the 13th century, the city was the capital of the Mongol Empire. It served as a hub for the Mongol Empire’s tribes and a cosmopolitan meeting place for people from a very wide range of nations and religions. Mongolians still regard Karakorum as a key site for the country’s history and identity, as well as the nucleus and birthplace of the Mongolian nation. It is almost impossible for contemporary visitors to the city founded under Genghis Khan to imagine the dramatic history that played out beneath the uneven terrain to the north of the Erdene Zuu monastery, which dates from the Modern era. Since 2000, German and Mongolian archaeologists have been working together to research the history of the city of Karakorum. 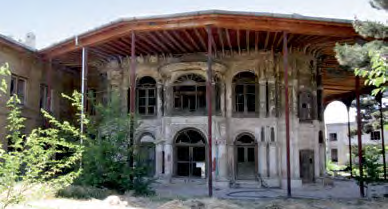 In addition to excavations in the city centre, they primarily concentrated on a detailed examination of the Great Hall in south-west Karakorum. 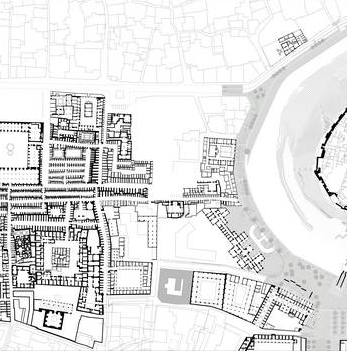 As the extensive excavations revealed, this was a square Buddhist temple whose walls were around 40 metres long. The magnificent hall designed in the Chinese style rose up from a two-metre-high, artificially stacked platform and was supported by 64 wooden columns on plinths in eight rows of eight. A stupa building in the centre and the division of the interior space into coloured flooring segments clearly demonstrate the mandala concept. The lotus thrones with the remains of large Buddhist sculptures lend weight to this interpretation. Although large parts of the building’s architecture have not survived, the high platform made of artificial layers of earth, on which the temple originally rested, is still recognisable today. In order to counteract the constant threat of erosion and the prevailing adverse weather conditions in Mongolia, extensive protection measures have been in place since 2013 as part of a conservation project. These include rebuilding the wall that originally surrounded the platform, extensively safeguarding the platform surface, uncovering the remaining plinths, and erecting staircases that give visitors access to the platform. Erdene Zuu monastery close to the excavation site. 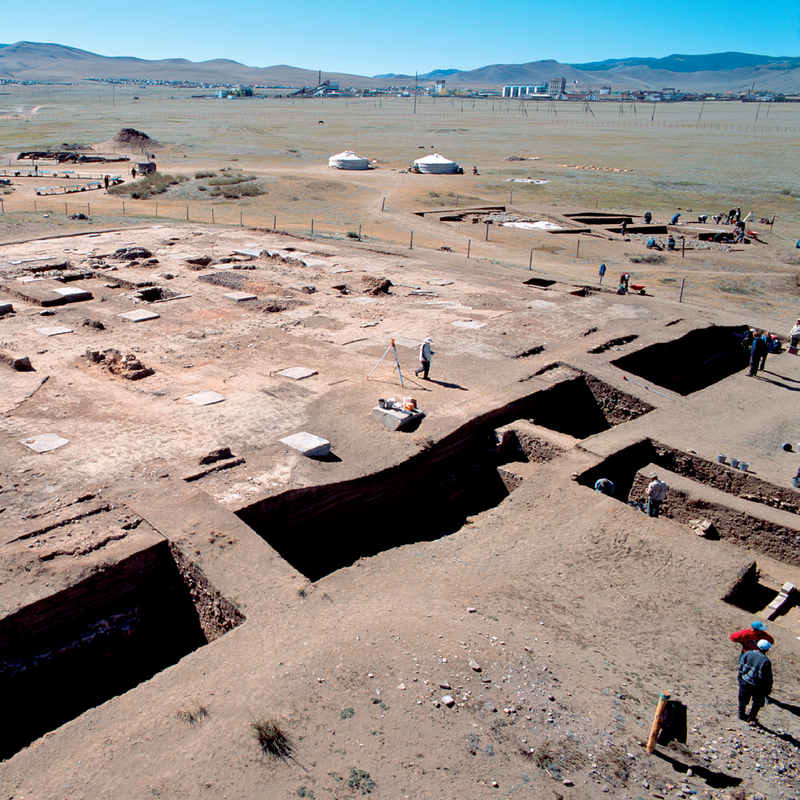 By protecting and partially reconstructing the monumental temple, episodes from the past which had a significant impact on modern Mongolia can be made accessible to a broad audience for the first time as part of the German-Mongolian research project. 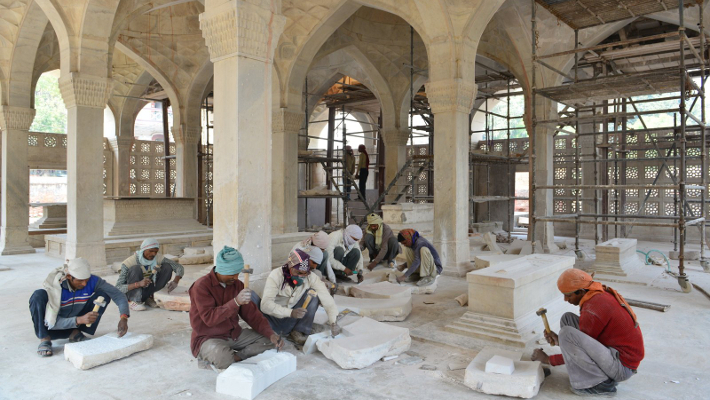 The restoration of Chaunsath Khambha, a Mughal mausoleum dating back to the early 17th century, was carried out between 2010 and 2014. 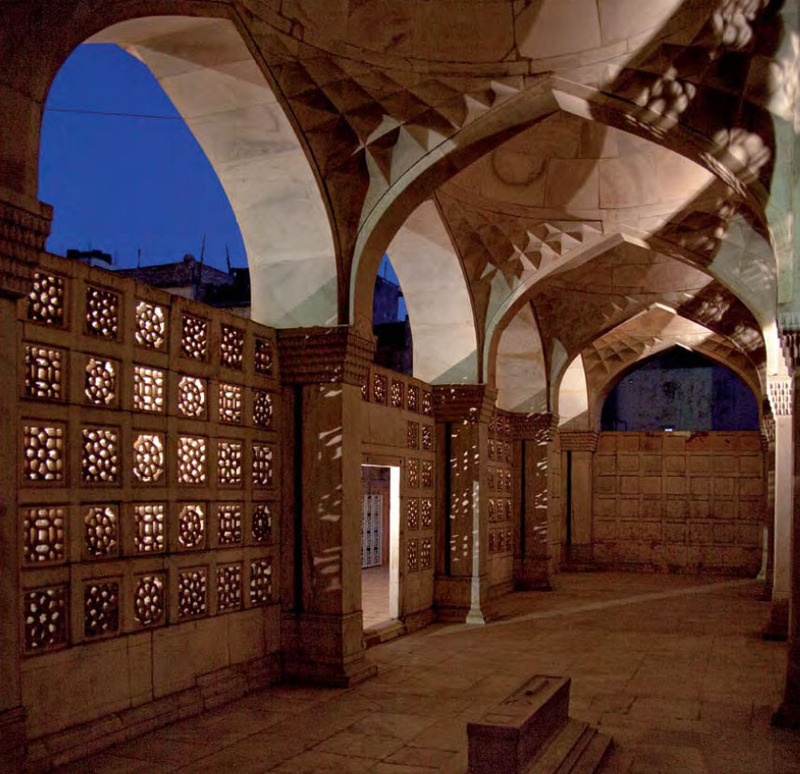 The project was part of the Urban Renewal project run by the Aga Khan Trust for Culture in the historic Nizamuddin quarter, where Humayun’s Tomb – a World Heritage site – is also to be found. For this unique project, the 25 marble domes in the tomb were removed and put back together by hand to replace centuries-old damaged iron dowels. Chaunsath Khambha was built in 1623–4 to serve as a tomb for Mirza Aziz Koka, foster brother of the great Mughal Emperor Akbar. The name reflects the tomb’s architecture: chaunsath (64) stands for the tomb’s 64 marble pillars (khambha). 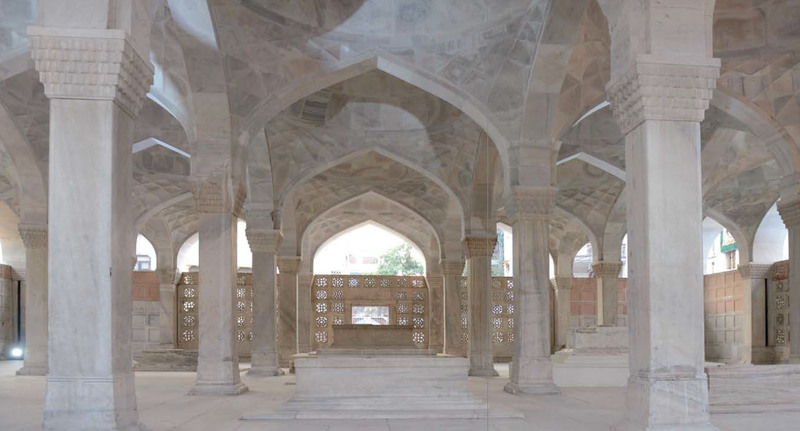 The mausoleum is unique on account of it being built entirely out of marble, with 25 marble domes supporting the flat roof of the structure. The marble blocks of the 25 domes are linked to one another and embedded in the brick masonry above the domes with iron dowels. The rain water that had collected on the roof over the centuries had severely corroded the iron dowels. This led to them bursting through the masonry in all parts of the mausoleum – domes, arches, façade and even the columns. The mausoleum’s entire structure was thus in jeopardy. unique architectural design and construction of Chaunsath Khambha as well as the fact that each stone was unique in shape and size, it was agreed that all original stones would be retained. To this end, each of the 25 domes had to be dismantled in order to remove the damaged iron dowels. Such an effort had never been undertaken before anywhere in the world. Once each stone had been numbered and catalogued, the individual marble blocks were dismantled and reassembled on the floor. The iron dowels were removed and cracks were filled using precisely-fitting stones. It took the stonecutters eight months to successfully repair the first dome using traditional building techniques – thus establishing the methodology for repairing the rest of the mausoleum. This allowed urgently needed repairs to the roof to be taken in hand. The repairs to the domes were coupled with repairs to the 35cm thick arch stones and the severely damaged diamond-shaped pendentives which support the marble domes. All in all, the repair of the 25 domes has taken almost four years, which amounted to more than 25,000 days of work for the stone craftsmen.